This book was interesting to me, and I hope my students will enjoy it, as some of them will be reading it during our unit of study on social issues in texts. Nothing But The Truth reminded me of Colin Kaepernick's protest, so that should be enough to get them bought in. Told through letters, memos, and transcripts of conversations, we learn about the controversy that occurs when Philip hums the national anthem in Ms. Narwin's class. What starts out as a minor dispute turns into a national news story, changing several lives forever. I am eager to hear my students' perspective on the main character. To me, Philip is awful (and it seems like others feel the same way, based on the Goodreads review titled "The Story of Some **hole Kid who ** up some poor teacher's life"), but I wonder if the students will take his side. 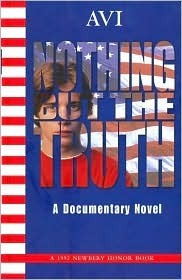 Although the novel was published in 1991, it resonates today, when a student can easily ruin a teacher's career. I really enjoy Avi's writing, which veers wildly from book topic to book topic, but is always quality.